$10 Admission includes "Battlefield Radio" use for ages 6 years old and up. 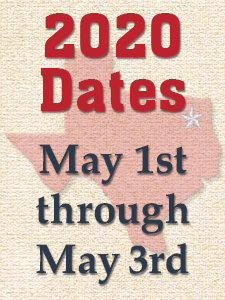 The 1st Battle for Jefferson at Bob & Kimmie Sanders' Cypress River Ranch takes place at 4:00 p.m. on Saturday, May 4th, 2019. The sounds of battle will be heard up and down the lazy river that winds through Jefferson – booming artillery with pyrotechnic ground bursts, cavalry and infantry all play a part in the "enacted" full-scale battle. 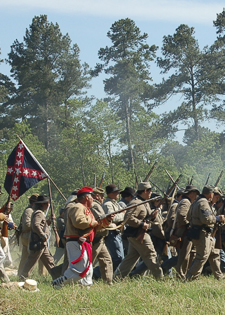 Will the Federal troops maintain their momentum from the Louisiana portion of the Red River Campaign and capture the important supply depot of Jefferson or will Confederate reinforcements arrive in time to route the invaders? 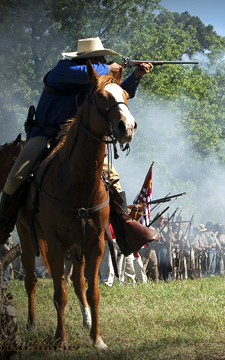 Attendees will have the unique opportunity to listen to a closed-circuit radio broadcast of the battle as it unfolds, complete with information about this fictitious aspect of the Red River Campaign, military strategies employed and even the uniforms and weaponry worn and used by the combatants. Additionally, guests will be able to text questions to the broadcasters and have them answered over the air. Admission is $10 per person (children under 6 are free) and the first 500 through the gates will receive free use of the radios required to hear the broadcast. 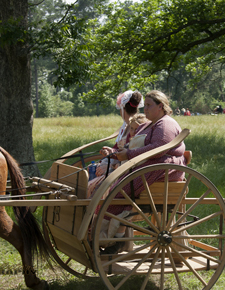 Sunday's (May 5th, 2019) closing battle at Cypress River Ranch (1:30 p.m.) decides the fate of Jefferson. Confederate and Federal troops again take to the field with more artillery barrages, cavalry charges and infantry engagements. As on Saturday, the first 500 guests will receive radios enabling them to listen to the informative broadcast describing the action. Tickets to this colorful finale are $10 at the gate with children 6 years old and under welcomed at no charge.